Santorini's Balcony is nestled on the famous Caldera in Imerovigli. It features an outdoor pool with hydromassage section, poolside bar and a sunbathing terrace with views of the volcano and the edge of the cliff. Santorini's Balcony Art Houses offers a choice of air-conditioned and self-catered accommodation types. Each with a sophisticated decor, all units have balconies with views of the sea, traditional furnishings and free Wi-Fi. Each morning, family-run Santorini's Balcony Art Houses serves a buffet breakfast. 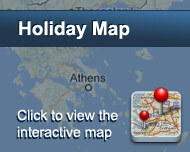 A variety of Greek taverns and international restaurants can be found within walking distance. Hotel staff are available 24/7 and will be happy to recommend restaurants and offer insider’s tips on Santorini’s places of interest. Είστε ιδιοκτήτης ή διευθυντής στο SANTORINI'S BALCONY; Εγγραφείτε τώρα για δωρεάν εργαλεία, που μπορείτε να χρησιμοποιήσετε για να βελτιώσετε την καταχώρησή σας και να συνδέσετε την ιστοσελίδα σας και το σύστημα κρατήσεών σας.